The SAFEST and World's FIRST ever Fire Hose Cabinet System able to be FULLY 'Charged' and FIRE-READY within mere SECONDS at the Fire Hose Cabinet Site! Click here to download printable PDF file of webpage. Which requires complicated Non-Obvious procedures to ATTEMPT ...yet consistently FAILS to deploy! The WORLD's SAFEST and MOST EFFICIENT EVER! Stand alone! ...deployed in seconds! ...w/in feet! ...w/ NO Water-Restrictive Kinks! EVER! ...and FIRE BLANKET to PROTECT UP TO THREE (3) VICTIMS w/in a FIRE SHELTER to trap breathable AIR! ...but especially as a quick Retro-Fit that for the FIRST TIME PROVIDES IMMEDIATE FIRE PROTECTION! 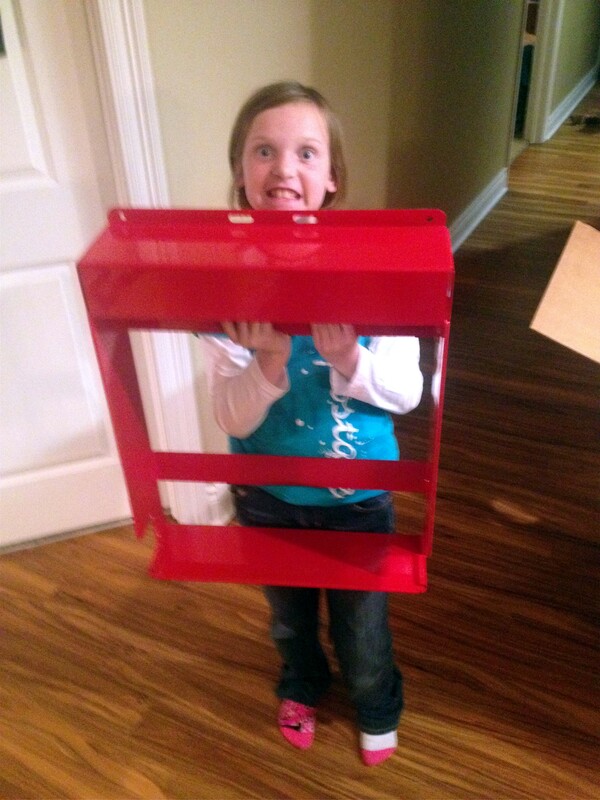 Have you ever taken a moment to read the instruction label on any current internationally recognized 'Pin-Rack' Fire Hose Cabinet in use today? Please note these are NOT for responding Firefighters, but rather specifically designed as intended for the immediate use of Fire Victims who are expected to utilize these lines to protect their SAFE EGRESS BEFORE we arrive! Because every hose is affected by the same unavoidable Laws of Physics as observed when deploying a standard hard round garden hose, every 'engineered' fold then MUST BE unfolded as FAST as possible in order to make every viable attempt to flow water to the nozzle to protect an escape route! If a garden hose can be immediately utilized from a coiled configuration without arranging one inch, does it not make sense to COIL fire hose in the same exact manner to render it immediately 'Fire-Ready' as well!?! The reason most feel we would never FOLD our garden hose is that it would be totally impractical as it is already hard and round. 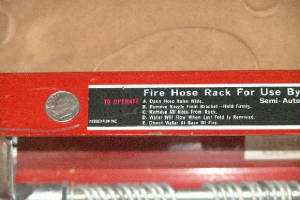 Then why do we store our Emergency Fire Hose in a folded configuration? It's FLAT [...but only when NOT in use!] and years of long lasting thoughtless TRADITION has prevailed! Again, think about what happens when you fold your pressurized garden hose!?! It stops flowing water! 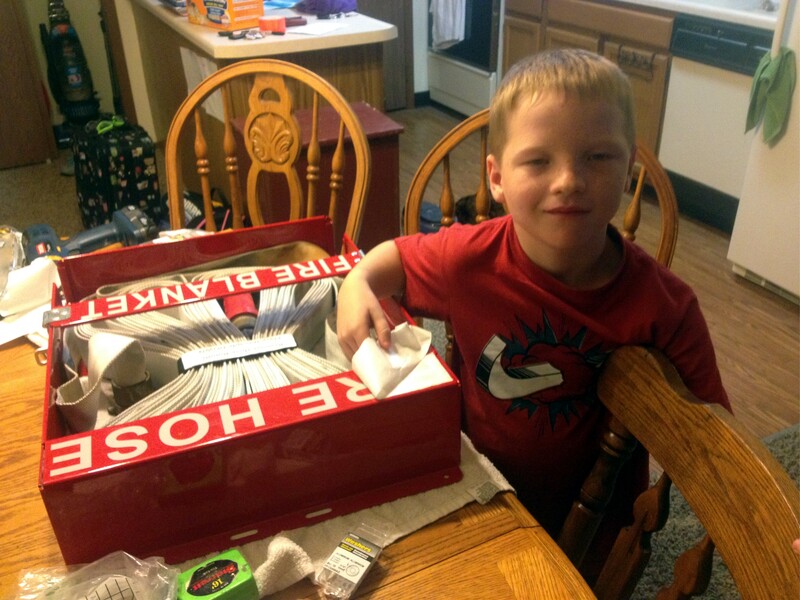 What happens when we FOLD our Fire Hose!?! It also STOPS the flow of water! As you have well deduced, the 'Pin-Rack' system defies any and all logical Common-Sense application but especially during a Life Threatening Fire Emergency when Human Nature proves REACTION is the only action taken! PLUS, if any necessary complex and/or non-obvious Life-Saving measures are required, these procedures are severely compromised and suffer greatly in the wake of the expected and resulting CHAOS. Hence the requirement of 'Panic Hardware' installed on exit doors in public and commercial occupancies. Please read the 'Pin-Rack' Instruction label below. Then take a few moments to compare this illogical mandatory action to the simplicity illustrated throughout the photos of the HFT [Immediate Protection] Hose Cabinet System! A complete system that not only stands alone on any wall or post assembly [an incredible SAVINGS in hardware and installation costs! 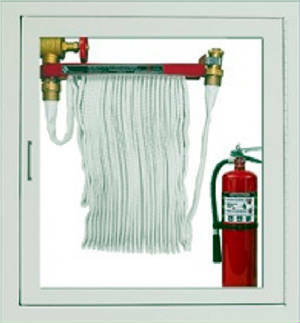 ], but it can also retro-fit literally ANY existing Fire Hose Cabinet system in use today in a matter of minutes! We use the same hose, same nozzle, and same fittings! ...yet we prepare the hose just a little differently [COILED] in a box container of appropriate volume for the flat hose to be prepared and stored for FAST, RELIABLE, and CONSISTENT 'KINK-FREE' SAFE DEPLOYMENT LITERALLY EVERYTIME! Again, this is the World's FIRST ever Hose Cabinet System to allow literally any Standard 'Rack Hose' to be fully CHARGED within seconds! ...at the cabinet site! 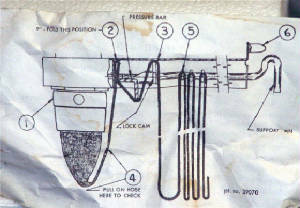 ...and with very few minor water restrictive kinks that are easy to manage once the water valve is fully open! 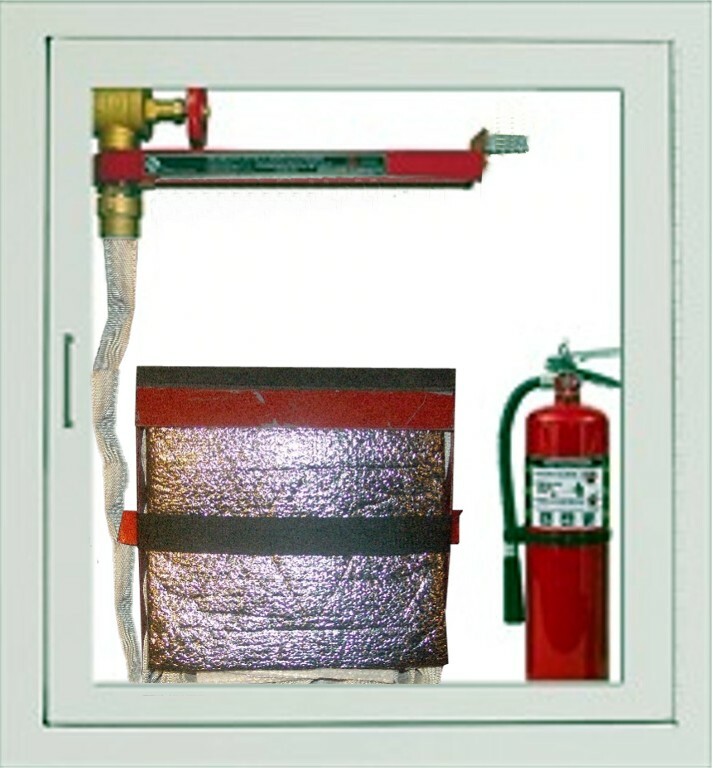 This COMPLETE SYSTEM is ALWAYS 'Fire-Ready' for your PROTECTION TO ASSIST EVERY FIRE VICTIM SAFE AND EFFICIENT EGRESS TO SAFETY! The complicated method of loading this apparatus! Perhaps you can now see why you're instructed to FIRST Open the Water Valve FULLY! Please note the DIME to the left of the label! You're expected to read, memorize and EXECUTE each listed and NON-LISTED step effectively! Upon PROPER ASSUMPTION, the Fire Victim must then REMEMBER as ADVISED that the 'Water Will Flow When The Last Fold Is Pulled.' [Please note illustrations above that direct such a procedure as the fire hose is pinched between two objects in order to PREVENT the flow of water! To further clarify, let's use the example the fire is half the distance between two (2) existing fire hose cabinets. In this case the fire is approximately thirty (30') feet away, which means seventy (70') feet of hose remains in the cabinet. 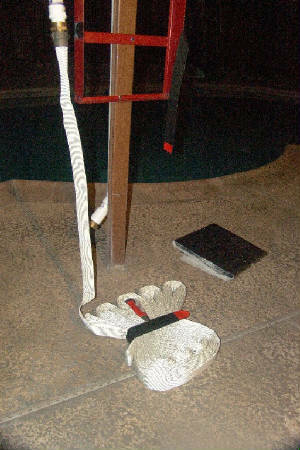 This seventy (70') feet of empty fire hose must be removed and 'laid' and arranged somewhere on the floor before the last fold is removed to allow the flow of water to this hose line. You guessed it; this is precisely why the typical fire victim rarely executes the non-obvious unlisted procedures as HOPED! Kinked and unfolded hose is 'laid' in piles and back and forth perhaps several times in which very little or absolutely no water pressure is achieved at the nozzle! 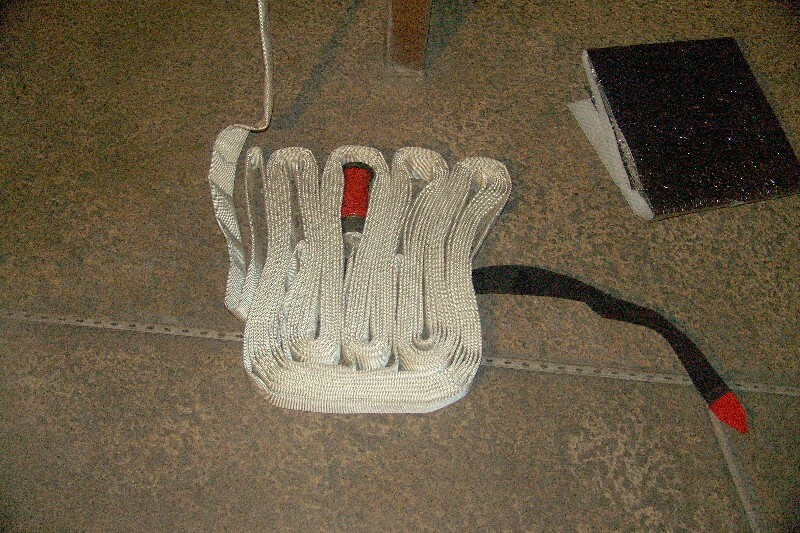 The following are photographs to illustrate each simple step necessary to deploy 100' of flat 'PRE-COILED' and stored fire hose cabinet hose from the time of need to the final steps of deployment up to 100' feet away from the cabinet. 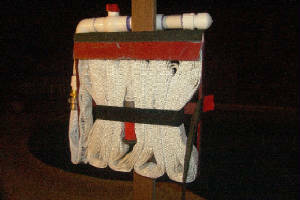 In literally every possible scenario, the fire hose is FULLY CHARGED and [after minor manipulation as seen in the video] Water Restrictive KINK-FREE at the cabinet site for MAXIMUM PERSONAL PROTECTION every step of deployment up to and including the FULL length of the hose until SAFE EFFECTIVE EGRESS IS ACHEIVED! Please bare with me as this page will be updated with video presentations and other supporting data as it becomes available. Your feedback is greatly appreciated! A Simple Illustration to SAFETY! 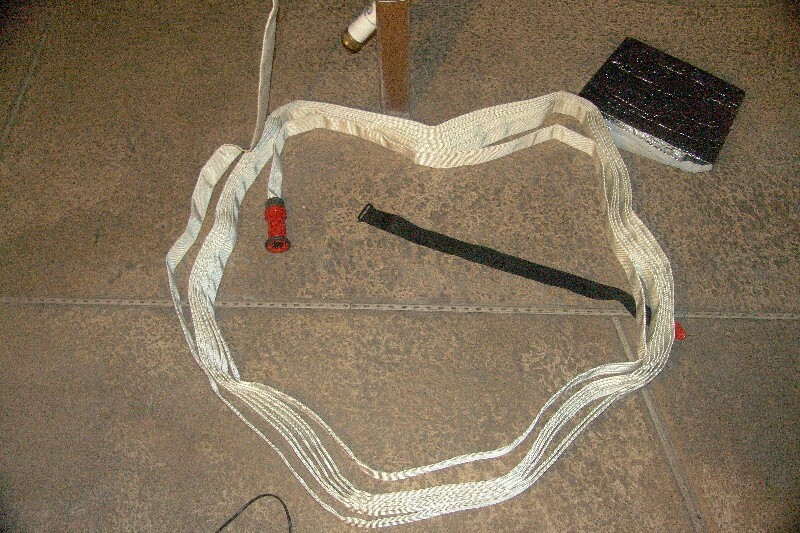 This strap secures the FIRE BLANKET and hose bundle in the cabinet box. 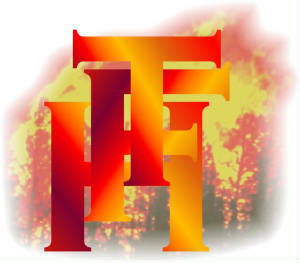 Fire Blanket is removed to protect YOU from heat! 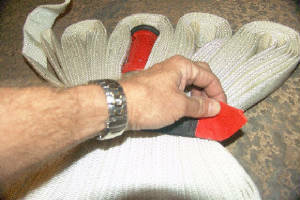 ...as the hose bundle is secured at Box upper flap with velcro release strap hidden on reverse. 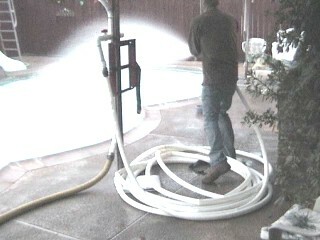 ...with just enough hose to reach the ground level. 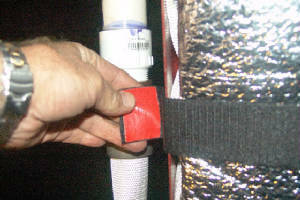 ...and pull through the plastic clasp to release the hose bundle. 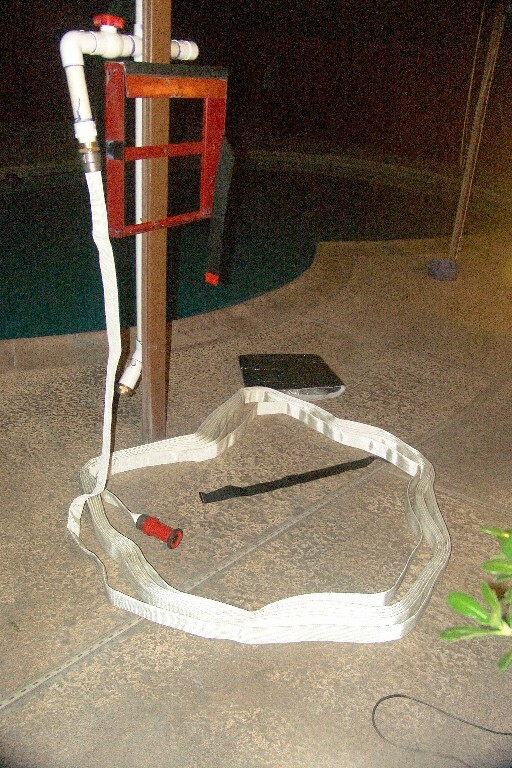 The hose can be QUICKLY arranged as illustrated..
or simply filled with water to accomplish the same configuration! Fully 'Charged' at the Hose Cabinet Site! 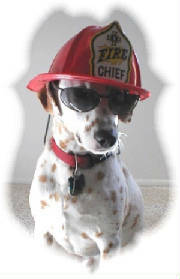 Able to extinguish a fire within SECONDS for Maximum SAFETY! !